Chuck Berry’s songs, music and particularly lyrics defined and painted a picture of the USA that few of us knew at that time This was coupled with a driving beat with that superlative guitar intro to many of his songs. On top of this he was an original. 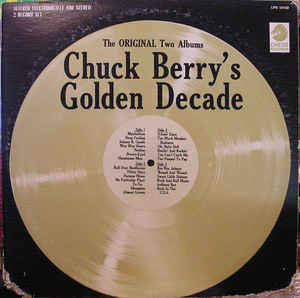 When a Chuck Berry record came on the radio it needed no introduction. He was no doubt the founder of the Rock n Roll era and his influence continues. His songs that kicked off the Rock revolution were taken up a number of years later by the Beatles and The Rolling Stones and they formed the basis of their respective stage acts in their early days. He remains the most influential figure in music in my lifetime. On 19th February 1967, I saw Chuck Berry top the bill – well of course he always did top the bill – at The Saville Theatre in London and supporting him that night and on the tour was Del Shannon. I saw the matinee – but in the evening performance the place went wild and some seats were wrecked. Apparently the fans wanted to see Chuck Berry and the lead up acts in between Del Shannon and him were not what they wanted. The Beatles were in the audience that night too. 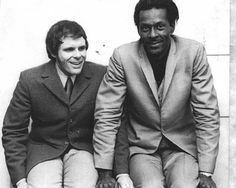 Del Shannon was very good – but Chuck Berry was on a different scale – probably the best artist I have ever seen ‘Live’ and in concert. He was just sensational. He was born in London in 1908. Connery started working as a theatre critic and journalist in pre-war time London, and worked for several newspapers including the Sunday Despatch. He fell ill with tuberculosis and had to spend the war recovering in a sanatorium on the Isle of Wight. But recover he did, and in the decade following the war he became the editor of two cinema magazines,The Kinematograph Weekly and The Picturegoer, and then as editor of Illusrated. Following this, in the mid-1950s, Connery became an Executive Film Producer for the Rank Organisation at Pinewood Studios. During his time with Rank he was involved in creating two crime drama series, Interpol Calling and Ghost Squad. 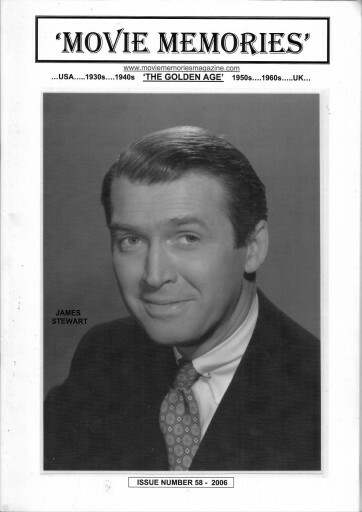 In 1960 he set up his own company, Amlin Film Productions. Amlin produced several documentaries about the electricity and steam industries, in addition to making the film The Two Salisburys which compared the eponymous towns in the UK and Rhodesia. Connery authored several fiction and non-fiction titles throughout his career. His most notable published title was his account of the lives of the internees on the Isle of Man during the 2nd World War entitled Island of Barbed Wire. His fictional writing included Trouble on the Line – a story of a mix-up at wayside railway station – and The Arrival of Master Jinks – the story of a doctor who discovers a drug that reduces the human gestation period from nine months to three months. This is just the sort of Christmas Present children of the fifties would receive – and love to receive – as it contained hours of reading and news of the film stars and films that we were all waiting to see when they came around to the local cinemas. 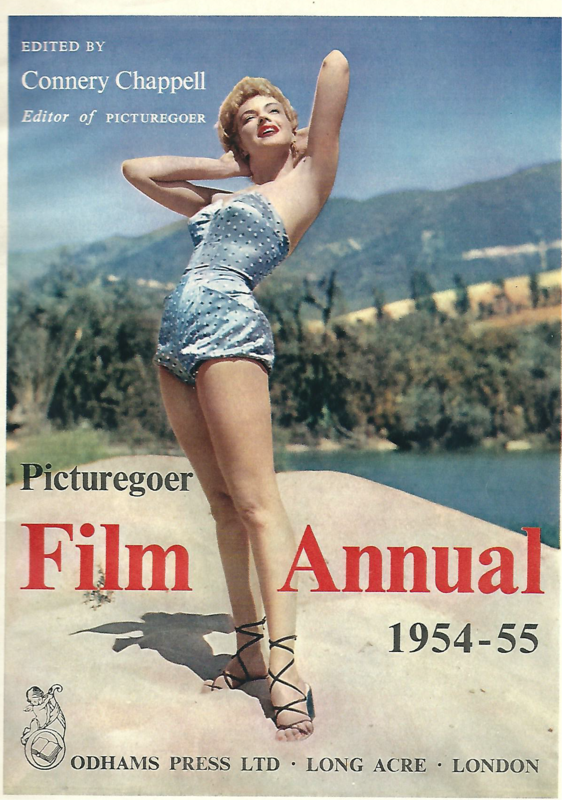 In this issue there were interesting articles on Audrey Hepburn, Norman Wisdom, Marilyn Monroe, Rhonda Fleming and many more PLUS a section on 3D which was in vogue at the time. 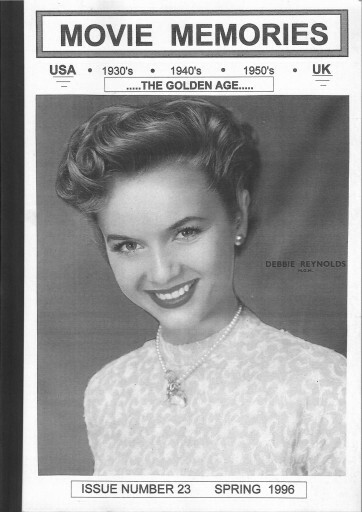 Pictures also of Robert Wagner, Grace Kelly, Gina Lollobridgida, Charlton Heston, Jack Palance – the list goes on. Films featured included Julius Caesar, Trouble in Store, The Glenn Miller Story, Tha Band Wagon, Doctor In The House, From Here to Eternity plus features on Jack Hawkins, Debbie Reynolds, Janette Scott, Cyd Charisse and John Wayne. The last article is about the NEW Wide Screen process – which is headlined Wide Screen is Here To Stay – and so it proved to be – and we read of a number of films done in this process – King of the Khyber Rifles and Knights of The Round Table. This film is technically just outside of the Fifties being released in 1949 but a great film nonetheless – and starring two actors who were well able to add some zest to any production – and they certainly did in this one – Samson and Delilah. This lovely colour still is scanned from an old film annual of the time – and in those days whatever process they used I do not know but somehow the colour had a special brightness and sharpness that is very much of the era – difficult to say what it is but a sort of old fashioned classy look and eye catching too. 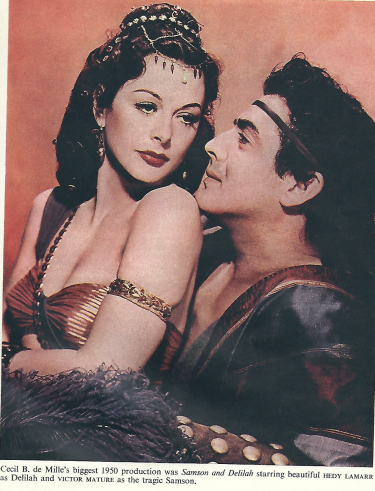 This is Victor Mature’s most memorable film and Hedy Lamarr’s too. George Sanders,even in a biblical epic remains the original English scoundrel and gentleman!The acting of others is equally professional and convincing.Thr direction and editing is brilliant. The later part of the film has a lot of passion and pathos with Victor Mature excelling as the blind Samson. The destruction of the temple still evokes wonder and awe even after all these years and remains a very fine and enjoyable film – one of the best of its kind. This is a great magazine – and has been running for a number of years now – based in North Lincolnshire England. The examples below are quite old magazines but absolutely packed with articles and information / news on many films and actors. For £ 15 subscription you receive THREE editions each year – and each one is packed with film information spanning the Golden Days of Hollywood and the British Cinema. I cannot speak too highly of this superb publication and look forward to each new edition.